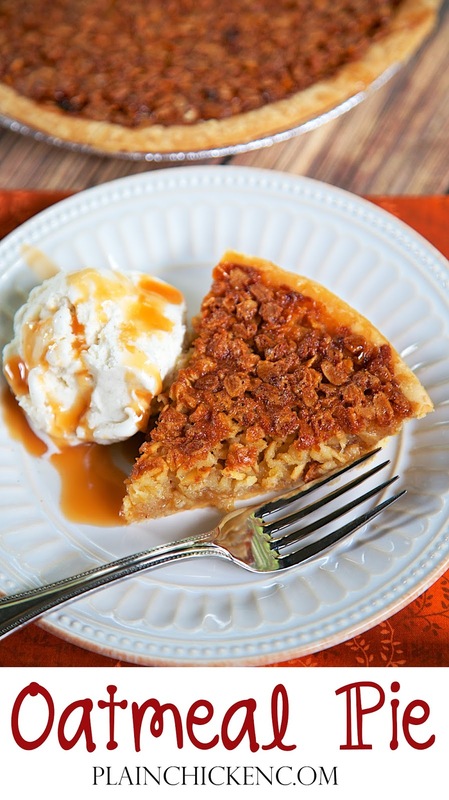 Oatmeal Pie - tastes as good as pecan pie without the expense! This pie can be made several days in advance. Serve warm with ice cream. YUM! Great for the holidays. 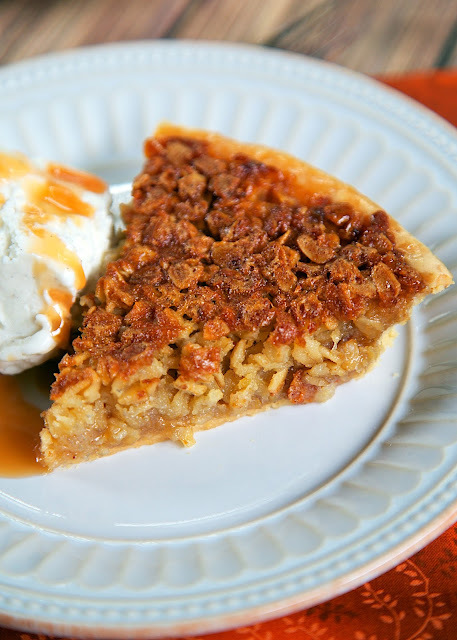 This Oatmeal Pie is from one of my favorite cookbooks, Candlelight and Wisteria. It is a cookbook that is a compilation of recipes from parents, friends and the staff at Lee-Scott Academy in Auburn, AL. I love these type of cookbooks - recipes from real people! I marked this Oatmeal Pie recipe it to try this holiday season because it was described as "Tastes as good as pecan pie without the expense." 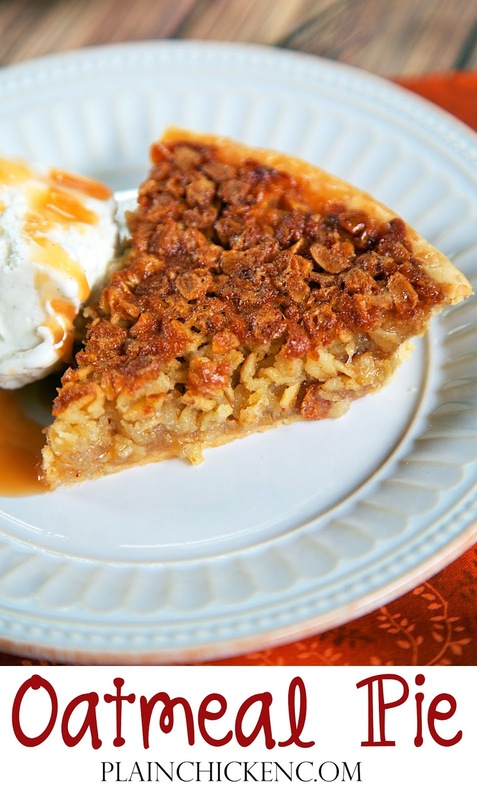 We love pecan pie, but it really can be expensive with all the pecans. I decided to put the description to the test! Well, the contributor was spot on. This Oatmeal Pie did taste a lot like pecan pie! I might even prefer it to pecan pie. We served this with some vanilla ice cream and caramel sauce. YUM! One note about this recipe, I used a regular frozen pie shell, not a deep dish pie shell. Make sure to grab the regular and not the deep dish pie shell when you are at the grocery store. Whisk together sugar, corn syrup, melted butter, brown sugar, eggs and vanilla. Stir in oatmeal. Pour into regular frozen pie shell. Bake for 45 minutes. Cool on wire rack. What kind of oats? Regular or quick? Cooked first or added dry? Could you adapt this for steel cut oats? Don't cook the oatmeal first - add to pie uncooked. You can use regular or quick cook oats. Have no idea how to adapt this for steel cut oats - I don't cook with them. Thanks for the info. We will give it a go on Thanksgiving. When Tad gets full, let me know. I'll be glad to do the eating for you!!! 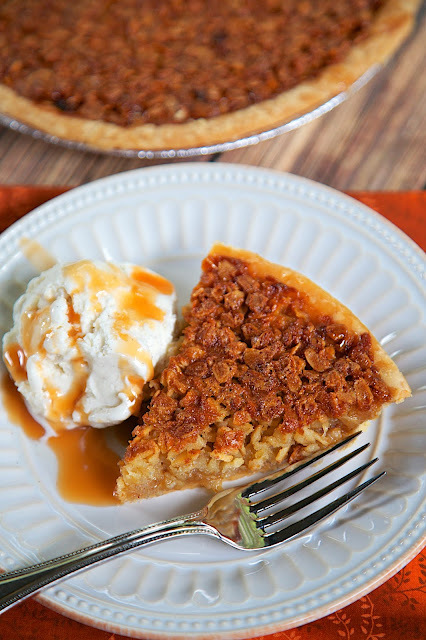 I've made this pie for a long time, and I agree, it is better than pecan pie. You might also try ritz cracker pie - it tastes a lot like apple pie. Very tasty! I added some oatmeal cookie spices too (1 1/2 tsp cinnamon, 1/2 tsp each cloves, ginger and nutmeg). Mine took a little more than an hour to bake and seem set up enough to take out of the oven.